I was ready. 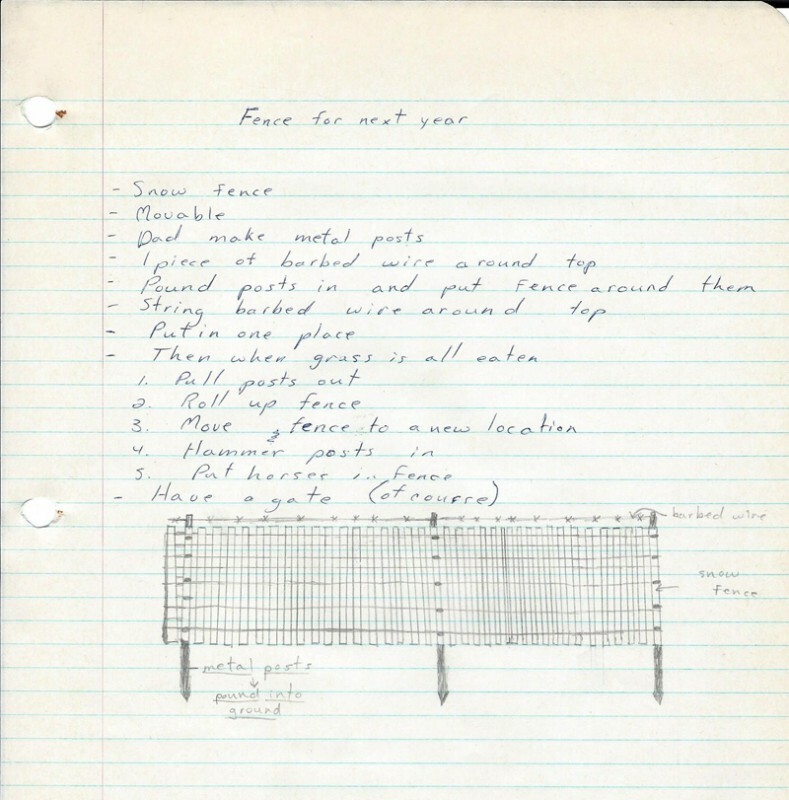 I even had a temporary fence all drawn out in my “Horses Binder” so that we could pasture the horses in the neighbour’s field across the road. My dad came up with a better idea in the end, but I think he was impressed with my ingenuity and determination. 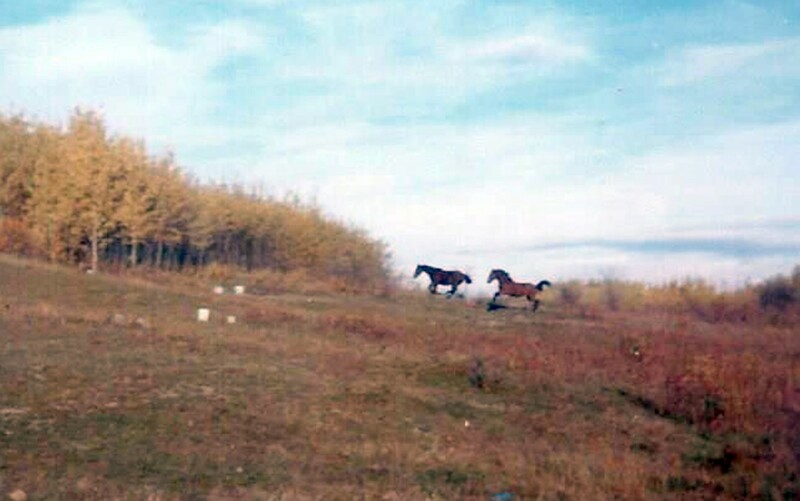 The first stop was a farm outside Fort St. John where they had not one but two horses for sale. Perfect. One was a buckskin mare, the other a smaller bay gelding. Looking back on it, that buckskin Quarter Horse was ideal for me … well-trained, quiet, not spooky. However, as I recall, I thought her boring. 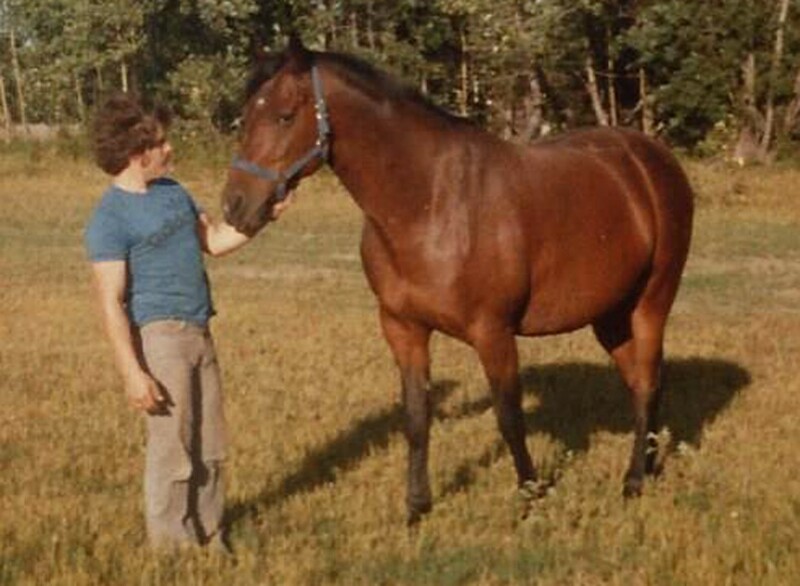 The bay gelding was super sweet, Pride, and he became my sister’s horse. The next stop was a little homestead at Farmington owned by a couple of my mother’s Northern Lights College colleagues. It was a crazy place, with afghan hounds, incredibly long-horned goats, and Shandy, a 4-year-old, 3/4 Arabian 1/4 Quarter Horse gelding. Poor Shandy was missing most of his tail after one of the goats had become tangled in it and had to be cut out, but he was still beautiful in my eyes. I took him for a ride down the driveway and onto the road, not noticing, or perhaps caring, that he was frightened of pretty much everything. He had spirit! When I turned him toward home and he broke into a run, I was sold. 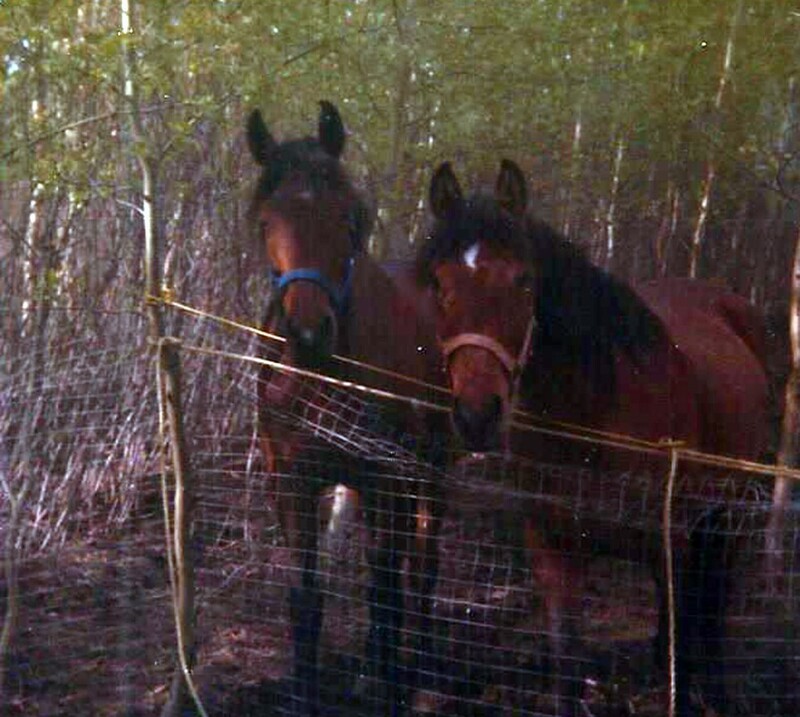 Shandy and Pride in their small corral behind the house (that I mostly built myself, as you can tell). Running free in Dad’s electric fence. Was he the right horse for me? Of course not (but he taught me much). He would jump six feet sideways if there was a gum wrapper on the trail (taught me to ride with a deep seat), threw his head when you checked his speed (taught me about martingales), didn’t like anyone on behind the saddle (taught me to ride through a buck), and refused to leave home without another horse along (taught me the little-by-little method of training). But he was kind and handsome and fun to ride and I can’t count the number of hours spent horseback that spring, summer, and fall. And later on, if we got to the show ring, he’d be … Shandazra. I’d found my horse. Susan and cousin Noreen on Pride, me on Shandy. Unfortunately for Shandy, by the following summer, when I turned sixteen, I’d also found a boyfriend. 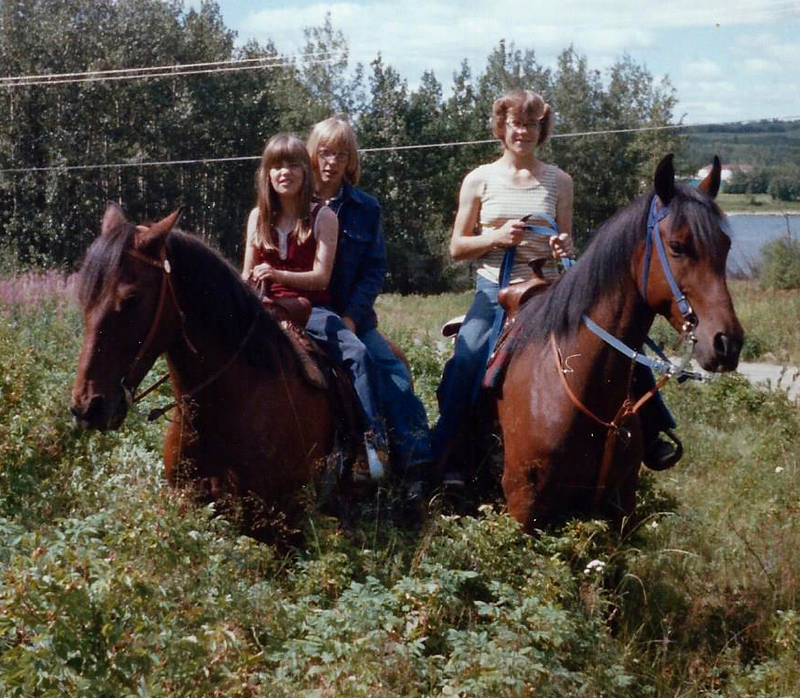 I spent a lot less time riding that year, and the year after, and when my parents moved to a place not able to house a horse, I had to find a place to board him. That boarding place turned out to be the farm where Lad had lived, the place that started my journey with horses. Horse meets boyfriend (look at that wary eye). 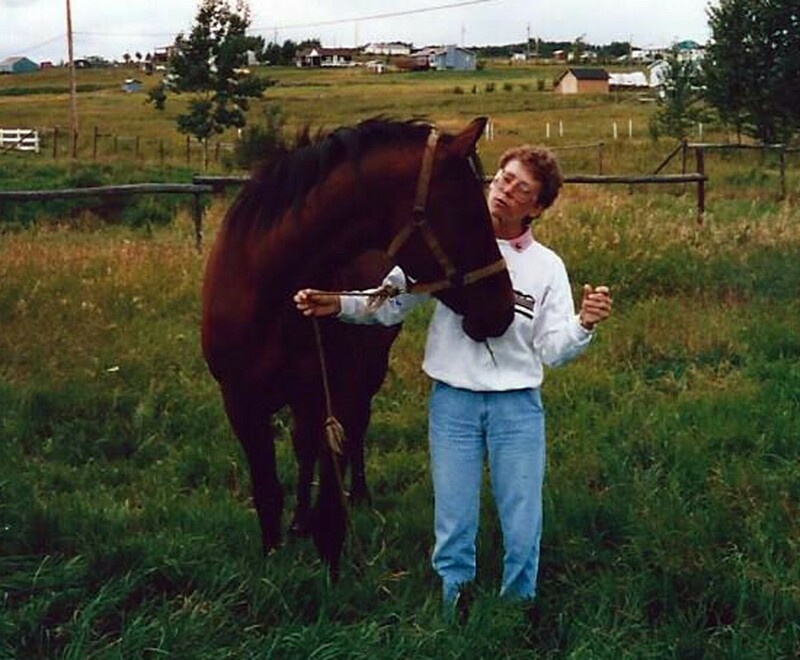 My second boarding arrangement was at the Fort St John Equestrian Centre where I cleaned stalls and fed on Saturdays to earn Shandy’s keep. The equestrian centre was my first opportunity to participate in any kind of riding lessons and I soon discovered that Shandy wasn’t well-suited to this new job. I suppose I’d noticed that he rarely broke out of his jig-jog into a flat-footed walk on the trails, but he was such a smooth ride that it didn’t matter. But, riding in an arena, in an English lesson, with a coach, he was expected to walk. The riding instructor and a visiting German clinician both tried unsuccessfully to get Shandy to walk for more than a few steps at a time but it seemed, at eight years old, his habit of jigging everywhere he went was well and firmly entrenched. If I wanted to continue my riding education and compete in upcoming horse shows, I needed a different horse. It just wasn’t Shandy’s thing. It broke my heart but I posted a for sale notice for my lovely boy. My first ever riding arena experience. 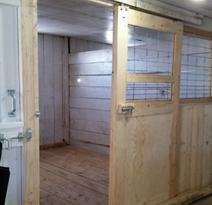 One of the many stalls I cleaned. Just a few days later, I was shopping in the town’s western wear/tack store and found my friend Ann’s oldest sister working behind the counter. She had once admired Shandy when she stopped to say hello on the road, said to call her if I ever wanted to sell him. That was a few years before so I’d forgotten all about that conversation. In the store that day, she asked if I still had that pretty bay horse. I said I did but I needed to sell him. She made an offer on the spot and Shandy went on to be an outstanding gymkhana horse for one of her daughters. He’d found his calling. I visited him years later, just a year before he died as it turned out, and thanked him for the time he shared with me, for his beautiful spirit. It made me so happy that he’d found what he loved to do and people to do it with. According to the family, he was the best gymkhana horse they’d ever had. Quick as lightning. And me? Well, I went on to my next mount … a sweet, bonnie lass who would provide a different sort of education. Nicely written Sis takes me back indeed and in such a nice way. And thank you for all that hard work you did so I could be a horse girl. Had no idea. Your horse binder is very impressive. Apparently your artistic talent was born much earlier than I thought also. This has been quite an educational journey reading your Steeds blog. Glad you’re enjoying the trip down memory lane with me, and that you joined me on my horse girl journey.